IMPORTXML is a very helpful function that can be used in Google Sheets to effectively crawl and scrape website data in small quantities (especially useful for grabbing titles and meta descriptions, etc.). It can be faster and more convenient that using Screaming Frog or other tools, especially if you only need to pull data for a handful of URLs. 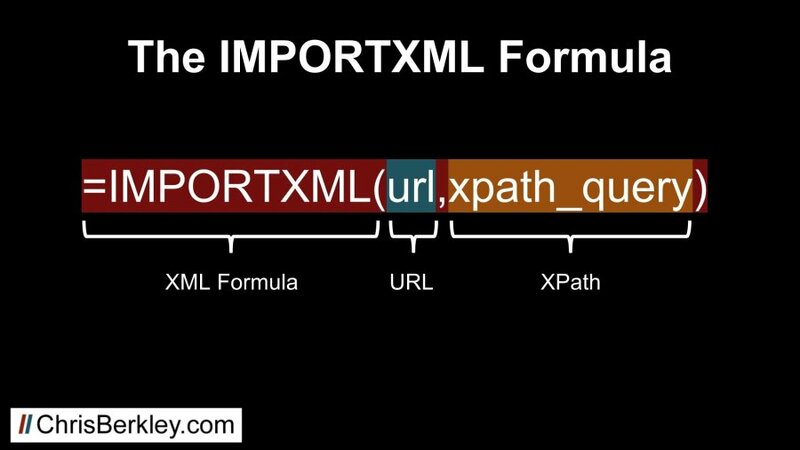 This post will show you how to use IMPORTXML with XPath to crawl website data including: metadata, Open Graph markup, Twitter Cards, canonicals and more. Skip Ahead: Get the free template. The first half of the formula just indicates what URL is going to be crawled. This can be an actual URL – but it’s much easier to reference a cell in the spreadsheet and paste the URL there. The second half of the formula is going to use XPath to tell the formula what data is going to be scraped. XPath is essentially a language that is used to identify specific parts of a document (like a webpage). Subsequent paragraphs will provide different XPath formulas for different pieces of information you might want to scrape. While social markup has no immediate SEO benefit, it is very important for sites that have active audiences on social media, and implementation of social markup often falls under the umbrella of SEO because of its technical nature. The following XPath formulas will allow you to scrape Open Graph and Twitter Card markup. Open Graph is used by Facebook, LinkedIn and Pinterest, so all the more reason to make sure it’s implemented correctly. Twitter Card markup is only for….Twitter. Still important though! Unfortunately, IMPORTXML & Sheets cannot be used to scrape large quantities of data at scale, or it will stop functioning. For more than a handful of URLs, it’s recommended to use a more robust program like Screaming Frog (Screaming Frog does not have a URL limit when using it in list mode). You can see how this works firsthand by making a copy of this Sheets Scraper Template and entering the URL of your choice in cell B6. To add additional URLs, copy & paste row 6, then enter a different URL. Questions? Contact me here or reach out on Twitter! I’ve found that ImportXML was unusable with too many formulas in one sheet so I decided to roll up my sleeves and make a much better function. My IMPORTFROMURL function does the same thing but, because it uses another engine and caches the data, you can easily make hundreds of calls in less than a minute. I’ve also added options to apply regex on the results. Yes, it’s possible. Just use =importxml(“https://domain.com/blog”,”//h2/text()”) and leave the cells underneath empty. It should pull all the H2s without issue. Thank you for nice information, I want to scrap product price from the given url, Can you please guide me how can i do that? Great article! Really helpful for beginners (like me) to get started with IMPORT XML function. Is that a limitation of IMPORT XML or is there something I could fix on my end? Did you confirm the meta description is actually longer? It’s possible that Facebook truncates the actual description in the HTML tag itself.